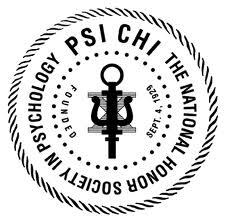 Psi Chi provides national recognition for academic excellence in psychology, on honor, which can be noted on employment applications, vitae, and resumes. Through membership in Psi Chi, students gain a sense of community with others in psychology and identification with the discipline. Psi Chi provides a local, regional, and national forum for obtaining information and developing perspectives about the field of psychology, learning about educational career opportunities, and forming meaningful professional networks. Members receive a membership card and certificate and, through chapter mailings, a copy of the Psi Chi newsletter. (Following graduation, members may subscribe to the quarterly newsletter). Psi Chi sponsors outstanding programs at regional and national psychological association meetings. Members benefit not only from the programs, but also form the opportunity to meet leading psychologists and students from other chapters. Membership is for life. The registration fee of $35.00 nationally and $20.00 locally, is the only payments ever made to the organization, which does not charge dues. Honor chords and medallions are available for graduation. Psi Chi also offers opportunities to present papers at psychology conventions. Members receive the Honor Society magazine and newsletter from the national organization. A Chapter directory is available listing graduate schools that are affiliated with Psi Chi. Remember: If you are ineligible for membership in Psi Chi, Psych Club membership is available to any and all students! If you are eligible and interested in membership, please complete the membership application at www.psichi.org. We will process new applications once per academic year in January for a late spring induction. We will notify all applicants in February of their status. Page last updated by Department of Psychology at 10:39 am December 14, 2018 . This page was printed from http://psychology.camden.rutgers.edu/undergraduate/clubs/membership/ at 4:00 PM Tuesday, April 23, 2019.